With the re-birth of Tuttoricamo as a blog, they tell me that they will not be publishing some articles that I wrote for their old website, but they have no problem if I publish them here so that perhaps they can be of use to readers. The following is about Italian Hope Chests. -- Renaissance Textiles, Antiques Digest, 1930. The history of the Italian cassone (marriage casket, coffer or chest) dates back to ancient Roman times. Referred to often as forzieri before the 15th century, they often came in pairs and were a gift to the bride in which she could take her things to her new household without the personal wealth of her trousseau items being on public view. Traditionally she made a wedding procession through the streets of the city from her house to that of her groom, or in the case of foreign marriages, into the city of her betrothed as brides usually went to live in the family home of the groom. 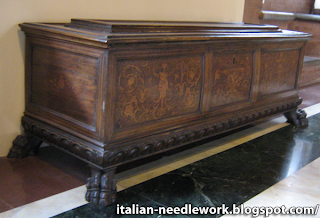 The cassoni soon became so richly ornamented that they themselves become symbols of the wealth of the bride’s trousseau and family and were considered some of the most precious pieces of household furniture. 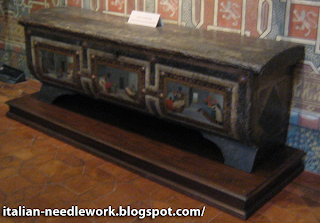 Italian cassoni were often richly decorated with Intarsia (inlaid wood), gilded Pastiglia (reliefs of very fine gesso), painted, carved or a combination of all these types, sometimes even having ivory carvings or bronzework. The ornamentation being so precious that the cassoni were often dismantled in later centuries so that the panels could be used as wall decorations. Many painted wooden panels in today’s museums are actually the panels of cassoni (see below - painted cassoni panels). Generally ornamented on the front and the two ends, they were sometimes decorated on the back although this side was only seen in the bride’s procession to her new home. The inside of the lid too, was often decorated, both elaborately or simply and sometimes the inventory of the cassone’s contents was written on it. 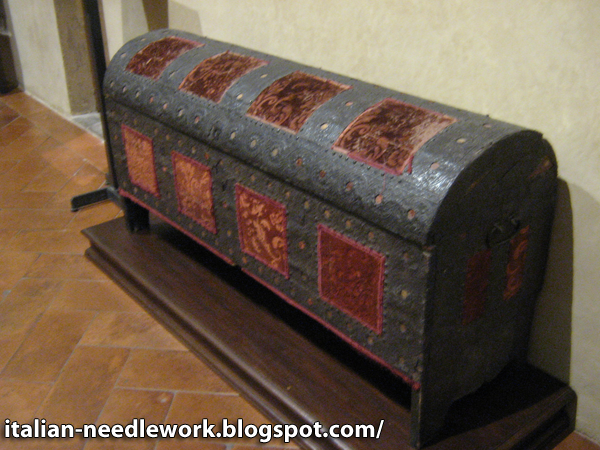 The cassoni were most often lined with fabric. Early painted panels depicted notable women like Penthesilea, Hippolyta and Emilia; Dido, the warrior Camilla, the Sabine Women, Lucrezia of Rome and Verginia and other heroines from ancient history done with the idea of guiding the bride toward exemplary behaviour. Scenes and symbols representing fertility were also popular. Lorenzo de’Medici (1449 - 1492) records cassoni with ‘Petrarchan triumphs’ in his inventories signalling perhaps a move toward less morally instructive imagery. In fact, painting styles on the cassoni changed around 1440 from Gothic to Renaissance style. Famous artists of the Renaissance like Paolo Uccello (c 1397 - 1475), Pinturicchio (c 1454 - 1513), Filippino Lippi (c 1457 - 1504), Masaccio (1401 - 1428) and his brother Scheggia (1406 - 1486), Benozzo Gozzoli (c 1421 - 1497), and Sandro Botticelli (c 1444 - 1510) and many others as well as countless minor artists were commissioned to paint cassoni. Several of today’s surviving cassoni panels have been attributed to the Florentine workshop of Apollonio di Giovanni (c 1416 - 1465) which specialized in work for private citizens. During this period, Florence was well-known for exceptionally magnificent cassoni. Both Cennini (c 1370 - c 1440) and Vasari (1511 - 1574) mention cassoni in their written works. Cennini gives instruction on which methods to use when painting cassoni in his Il Libro dell’Arte (1437). Vasari notes in his The Lives of the Most Excellent Italian Painters, Sculptors, and Architects (1550) that the fronts and sides of the cassoni were depicted with fables from Ovid and other authors or stories by Greek and Latin historians and even love stories, jousts and similar fair. 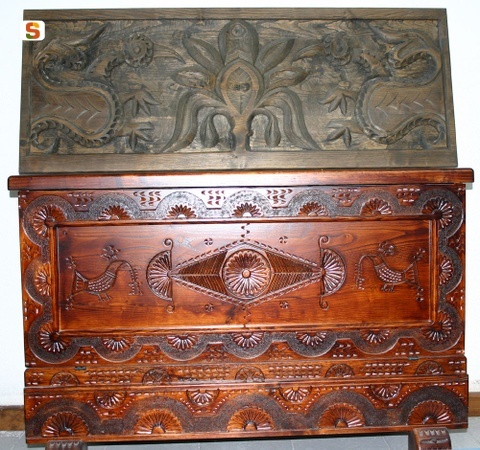 He also notes that the two family’s co-joined heraldry was also visible at the corners and elsewhere on the chests. Vasari recounts the famous artists of the previous centuries (one artist in particular, Dello Delli c 1404 - c 1470, painted quite a number of cassoni) who were not embarrassed to paint the cassoni as were the artists of his day signalling perhaps the period when ‘professional’ quality cassoni painting was in decline. “Isabella d’Este arrived in Mantua as the bride of Francesco II Gonzaga in 1490. In her luggage she brought thirteen painted chests, and Ercole de’ Roberti, the Ferrarese artist who designed them, travelled with her.” (The Court of Ferrara & its Patronage, by Marianne Pade, Lene Waage Petersen, Daniela Quarta, 1990.) Today we tend to think of a single marriage chest per bride, but this was not always the case. The more wealthy the bride’s family, the higher the number of cassoni she brought with her. In the mid-fifteenth century it became the groom’s family’s task to have the cassoni made and placed in readiness awaiting the bride and all her possessions in the newly outfitted nuptial chamber of their home. One of the motives behind this change in responsibility was Florentine sumptuary law restricting the pomp of wedding processions. Sometimes in the early 16th century a pair of cassoni might cost the wealthy as much as the sum of a skilled labourer’s entire year’s wages. Cassone from Verona c. 1490 in the Poldi Pezzoli Museum, Milan. 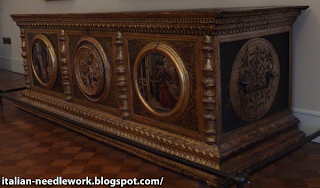 Cassoni were important pieces of furniture and figure in some ancient texts. Leon Battista Alberti (1404 - 1472) has one of his protagonists in his Libri Della Famiglia (1433) use a cassone when making an example so that his wife will understand when he attempts to teach her how to manage his household. Cassoni feature in a few of the stories of The Decameron (composed between 1348 - 1353) by Giovanni Boccaccio (c 1313 - 1375) and one is even the key element in Filomena’s story (second day, ninth tale). The story would later inspire Florentine painter Giovanni di Francesco Toscani (c 1370 - c 1430) to depict it on two cassoni around 1425. Other stories from the Decameron were often subjects for painted cassoni some of which survive today in various museums. With the changes in taste and views of marriage throughout the 17th and 18th centuries, the cassoni declined in importance and the quantity of decoration lessened. By the 19th century Renaissance cassoni were being dismantled and sold off in pieces to the new population of tourists on the Grand Tours of Europe – especially Britons and Americans who had money and an interest in bringing home souvenirs. The tradition of the cassone has trickled down through the centuries becoming all but lost in many parts of modern day Italy. Not since the 1950s has it been widely followed. Times have changed and for many of today’s Italian women, the cassone of their mother or grandmother has become their own in which they store trousseaux of magnificent embroideries and laces of the past and present for future generations. For some no family heirloom remains and they must hunt for a cassone to call their own in the antiques markets. 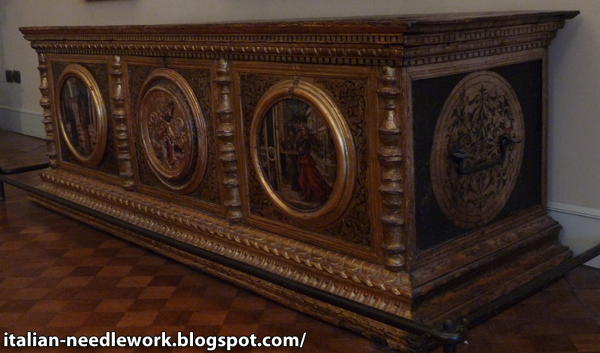 A number of Renaissance cassoni survive today, scattered around the globe by the many collectors outside of Italy. Quite a few of the world’s museums proudly display these fine examples of Italian art which have guarded the most exquisite pieces of Italian embroidery and lace. At Home in Renaissance Italy by Marta Ajmar-Wollheim & Flora Dennis, 2006. Cassone Painting, Humanism and Gender in Early Modern Italy by Cristelle Baskins, 1998. Inside the Renaissance House by Elizabeth Currie, 2006. The Triumph of Marriage: Painted Cassoni of the Renaissance by Cristelle Baskins, 2008. 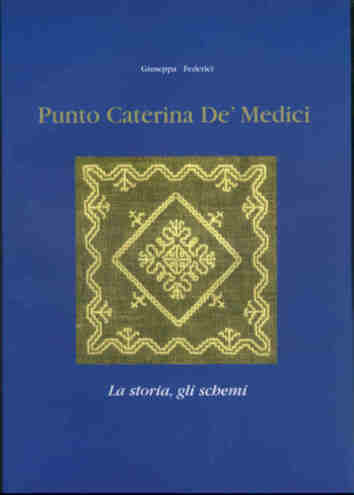 Sumptuary Law in Italy 1200-1500 by Catherine Kovesi Killerby, 2002. Thank you to Stefania for the photo from the Poldi Pezzoli and to Elisabetta for the photo from the Collezioni Comunali d'Arte! 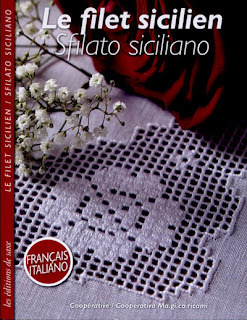 I have never seen a book entirely dedicated to teaching Sicilian Drawn Thread Work until this past spring. The Cooperative Ma.Gi.Co Ricami from Modica, Sicily put together a fine group of patterns and step-by-step instructions for the French publishing house Les éditions de saxe. The text therefore is in French and Italian. In 2009 I attended one of their free 1 hour classes on Sicilian Drawn Thread Work at the Italia Invita Forum. 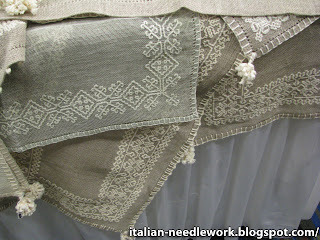 They showed me how to execute a netted area which is the base for all types of Sicilian Drawn Thread Work. I wanted to learn so much more but there just wasn't the opportunity. At that time they did not have anything prepared in the way of instructions that I could take away with me but I did purchase a finished piece and an already-cut piece of fabric from them which I told you about in this post. When a friend and I talked to the ladies at the Cooperative Ma.Gi.Co Ricami booth at the Italia Invita Forum in 2011 they said that the French publishing house had approached them with the idea of the book. It is 80 pages of colour photos and a pull-out section with patterns. There are traditional and non-tradition patterns including some fun whimsical ideas for kid's things... would you let your baby drool all over your Drawn Thread Work? I'm not sure I would but the bibs and things are awfully cute. The main three different types of Sicilian Drawn Thread Work are explained and the different languages are in different colours and therefore easily followed when searching for the text you're using. There is a tutorial at Tuttoricamo's new blog on how to achieve these different effects. You can get this book from Tombolo Disegni, click on "Libri", then "Libri Ricamo", then "Sfilati ed Assia", there you can also see some more pages of this book. Orvieto is situated in the central part of Italy in the Umbria region. I wrote a little about it here. 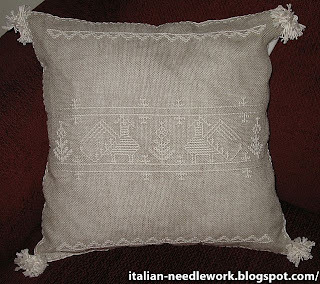 Umbria is rich in needlework techniques and history. 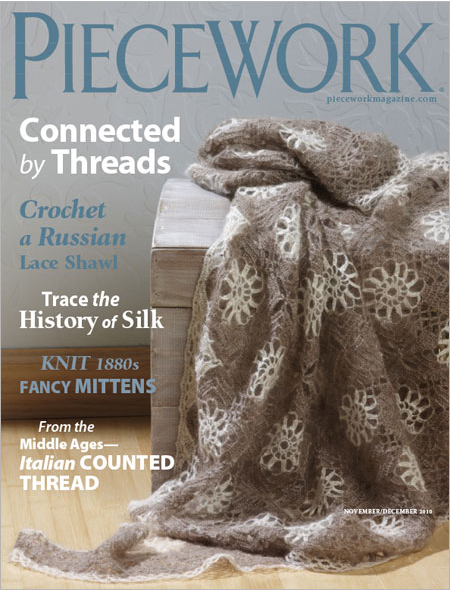 The town of Orvieto is best known for it's crochet lace. Cushion by Ars duemme exhibited at the 2007 Italia Invita Forum. 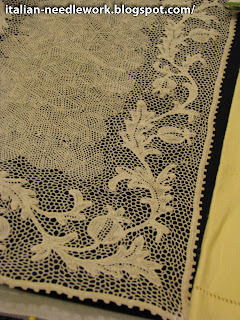 The lace of Orvieto was born at the end of the 19th century and in June of 1907 a patronage society for the women of Orvieto was founded with the aim of offering the town's women the opportunity to earn a modest income while occupying their spare time in a decent and not overly strenuous way. The idea was launched by Senator Count Eugenio Faina and was realized by his son Claudio, who gave the first funds to his daughter Maria Vittoria and to the noblewomen Eugenia Petrangeli and Pauline Valentini, who occupied themselves with coming up with a simple but also remarkable technique, that women could produce at home. The choice fell on the lace that was made with Irish thread which, as well as having artistically impressive effects, presented a technical level suitable for dividing a single artifact among workers. 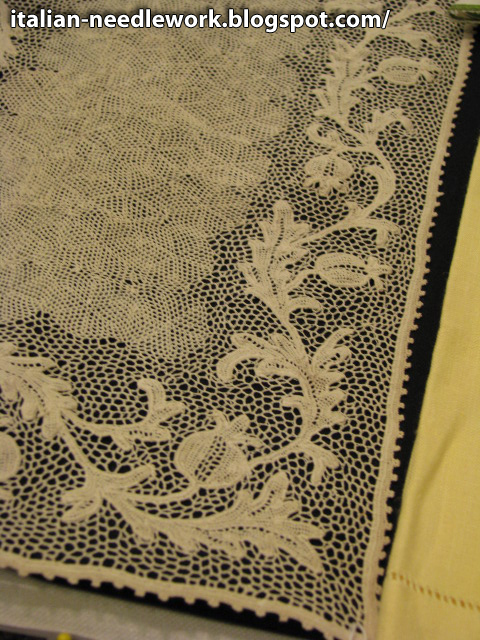 Right from the beginning, the lace took on the typical characteristics of Orvieto both from a decorative and execution point of view. In fact, the decorative motifs of the lace reproduce designs of leaves, ivy, acanthus and vine, flowers, animals and figures taken from the fourteenth-century bas-reliefs of the facade of the Orvieto Cathedral. The patronage society was called Ars Wetana, which testifies to the artistic level and the local peculiarities expressed in the artifacts. 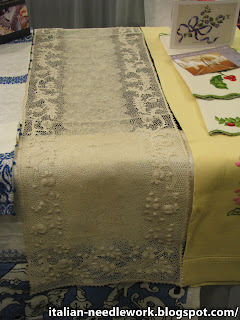 The Ars duemme workshop in Orvieto is run by a mother-daughter team who produce exquisite Orvieto Crochet Lace items and also run classes in this technique. First the individual crochet lace motifs are made against the design traced on a piece of fabric and then they are attached together with a crocheted hexagonal netting in various stages and sizes. When the work is detatched from the fabric, it is then ironed in a particular way. The is the most curious thing I find about this lace is how the bas-relief is achieved: with heated iron pieces! Of course it's quite tricky to find the balance between how much you can distort the work without scorching or ruining it but the bas-relief is quite prominent as you can see from the following photos which were taken at the EGA National Seminar in 2010, when Umbrian needlewomen visited to show us Umbrian needlework and textiles. 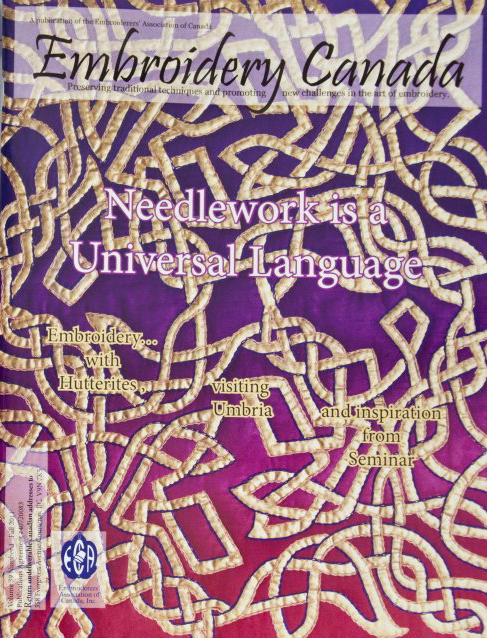 For those who are part of the Embroiderers' Association of Canada (EAC), the new winter 2011 edition of their magazine Embroidery Canada is being delivered right now and inside is an article I wrote on Catherine De' Medici Embroidery with a Placemat project designed by the Accademia Punto Assisi. I wrote this article in 2009 and am sad to report that the little store I visited in Assisi that I talk about in the article has since closed its doors. However the Accademia Punto Assisi is still going stronger than ever! 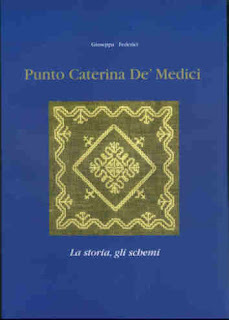 The patterns were taken from an excellent book called: Caterina De' Medici, La Storia, Gli Schemi by Giuseppa Federici. 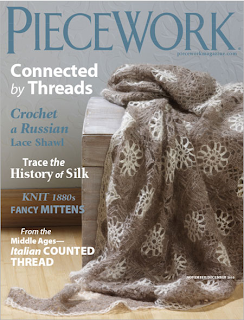 The peacock pattern can also be found in the Nov/Dec 2010 Piecework magazine with my accompanying article. 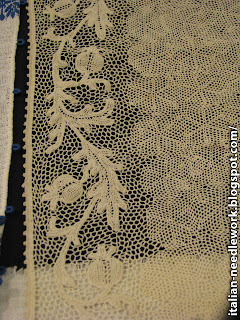 Caterina De'Medici Embroidery is a counted thread technique and is usually worked on an Italian fabric known as Buratto which today is a 100% loosely woven evenweave linen about 6 threads per centimetre (15 threads per inch), either cream coloured or unbleached (read more on Buratto here). 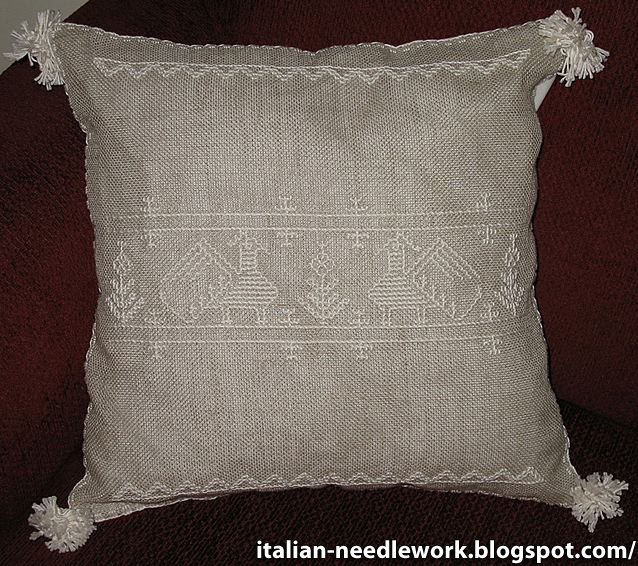 A thick cream-coloured or white twisted 100% cotton thread called “Cotone Povero” [poor cotton] is used for the stitching (done in Double Running Stitch executed in a particular way), edging and tassels. Edge treatments can be widely spaced Blanket Stitches or a double crochet edge with popcorn picots on a small hem. Knotted tassels in a variety of styles are almost always the finishing touch. Sometimes colourful hand-painted ceramic beads from Deruta are added. 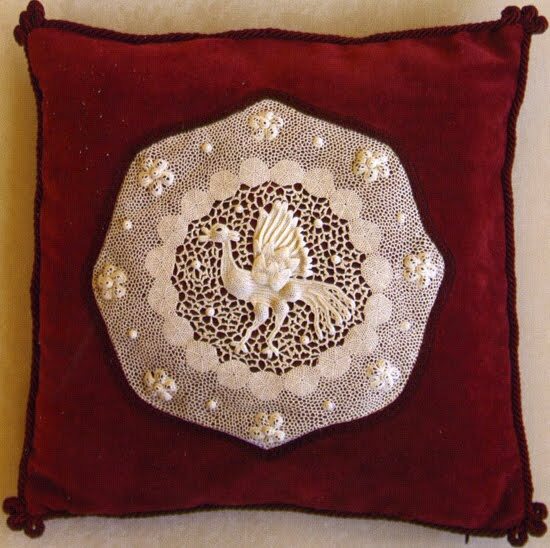 Those of you who have known and loved the Italian embroidery and lace website TuttoRicamo over the years were very sad to learn that production had stopped over a year ago. A tremendous achievement by two women in their spare time with the collaboration of friends, the website grew to enormous proportions in its five years of online life. The website was taken down, and then by popular demand, a reduced version was put back online so that readers could still have the benefit of the tremendous amount of information and research that went into it. This past month, the old website went off-line for good (in its original format) but it has experienced a rebirth as a blog. 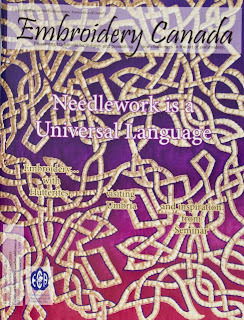 There are quite a few changes and much less material as it is trimmed down to information on the different Italian embroidery and lace techniques with book reviews when possible. It is also only in Italian text with a button for the Google translator. The ladies of Tuttoricamo are diligently and swiftly adding to the blog content, so it is worth bookmarking and checking back often, it will take quite some time to transfer the information from the old website and they are working hard to update information as well. Watch it carefully as it grows!